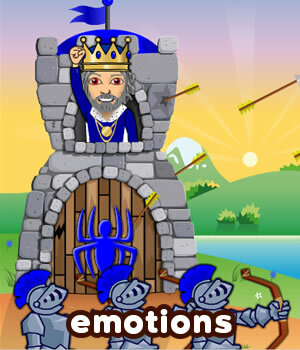 Teach ESL kids lesson how to talk about feelings using adjectives of emotion. EFL/ESL learners will learn basic adjectives for describing an emotional state. Adjectives of emotion usually describe intangible sentiments. The adjectives used in this lesson are those that are most common and easily perceived. After this lesson, a student should be able to perceive and describe a number of emotional states of others. The lesson also teaches the extreme forms of these adjectives. Therefore, instead of always using ‘very’ before adjectives, they will expand their vocabulary by learning synonyms that describe the same feelings but in an extreme form. Learn to give reasons or show causes of different feelings while using the conjunction ‘because’. The worksheets below are useful for offline and classroom activities. 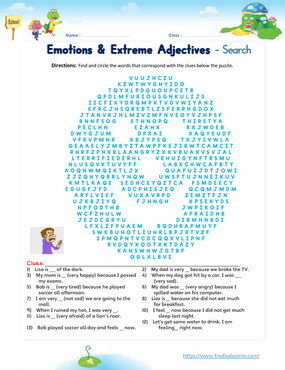 These printable exercises directly correlate with the above lesson 'Emotions'. Every worksheet comes with an answer sheet on the second page for educators. Mom is taking Freddie and Lisa to the mall. Freddie is happy because he is going to get a new hat. He ruined his old hat and felt very sad. The shopping is nearly a whole day’s event and they get hungry, tired and sleepy as a result. Lisa is happy because Mom orders pizza for lunch. I am happy because we are going to the mall. Freddie is sad because he ruined his hat. Lisa is hungry because she did not eat much for breakfast. Freddie is taking a nap because he is tired. Lisa is drinking water because she is thirsty. Freddie is delighted (very happy) because he got a new hat. Lisa is starving (very hungry) because she did not eat much for breakfast. Freddie: I am so happy we are going to the mall. Freddie: I want to get a new baseball cap. Lisa: What happened to your old one? Freddie: I ruined it because I went swimming in it. Lisa: That must have made you sad, Freddie. Freddie: It did. I was very sad I ruined it. And mad at myself that I didn’t take it off. Lisa: It’s okay, Freddie. You’ll get a new one today. Freddie: Yes, and then I will be happier. Freddie: Look, Mom! I found the hat I want. Mom: Okay, Freddie. We can get it. Lisa: Mom, can I get this hat? Mom: Yes, Lisa. You can get the hat. Lisa: Me too. I did not eat much for breakfast. Mom: We can go get some lunch. Freddie: I am happy I got this pizza. Lisa: It looks very good, Freddie. Mom: Are you less hungry now, Freddie? Freddie: Yes. I am feeling better now. Lisa: I am less hungry too. Freddie: I am getting tired though. Lisa: You should take a nap, Freddie. 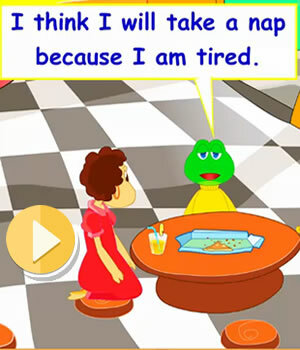 Freddie: I think I will take a nap because I am tired. Lisa: Are you taking your nap, Freddie? Freddie: Yes, I am tired. I will take my nap now. This lesson is part of the Level 5 English course.